Choosing a touring bicycle; Kona Sutra 2009. Now that I’m back from Hong Kong, even though I didn’t actually get to go, I’ve got another touring bike for you all. Next up is the Sutra from Kona. Please comment if you have ever ridden, owned, or know anyone who owns this bike. Email photos of your setup to me at recklesscognition @ gmail.com and have them posted on this site. Let’s have a look at the Long Haul Trucker’s spec sheet. Components-Mostly entry-level Shimano Deore components with an XT rear derailleur. First off, the 2009 paint job is much improved over the drag colors on previous model years. I love colorful frames. The Kona sutra is a dedicated touring bike and comes with front and rear racks for your heavy loads. Although our initial review stated the bike only had 32 spoke wheels, further review and helpful comments from our visitors have led us to the conclusion that there are actually 36 spokes. Thanks for the input! Expect this bike to be heavy, disc brakes, racks, fenders, etc are really gonna load this bike down. Even though it is heavy, from what I’ve heard, the frame is super rigid and actually handles the weight well. There has been a set of complaints about rear-wheel spoke breaking being quite frequent. There are also disc brakes on the bike, which are good for poor weather, but not necessarily good for bike tours. Looking past the brakes and spokes, there is a bit of an issue here with foot clearance. Just looking at the photo of this bike with racks hints at a possible problem. They look mighty close to the pedals, especially that front rack mounted at such an angle. There have been numerous issues with lack of foot clearance with the Sutra. If you’ve experience otherwise, please let me know. Let’s look at the ratings a little more in detail. Value: This bike retails for about $1,200. This price is too high for the package. You’re getting basic components, and a steel frame. Sure, you’re getting two racks, but is that worth $300? Quality: I don’t think there are any problems specific to this bike frame, but the wheels have caused problems to numerous customers. Compliance: Disc brakes and a short chainstay (lack of foot clearance) are the main issues here. I didn’t think think bike would score so low but looking at it closely I think the rating is justified. I’d love to hear otherwise, so let me know if you’ve owned this one before. 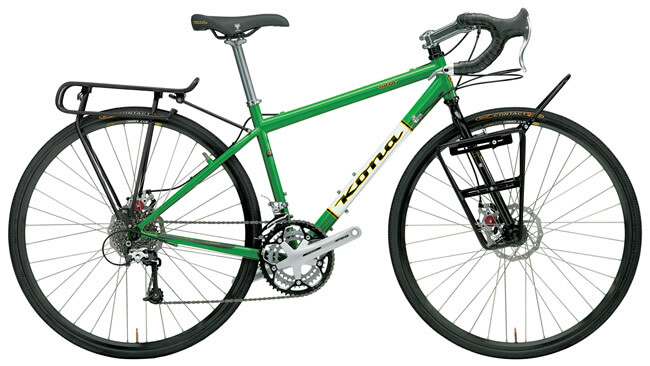 Yeah, the Kona Sutra is a killer ride for commuting or long tours. Definately would recommend. I seriously considered this bike before the issue of toe overlap came up. I know folk say, ach, won’t be a problem, but I wasn’t going to take the risk after all, it’s a pricey machine. And now that you mention it, 32 spoke, especially on the rear is just too mean. The disc brakes I thought was a good idea – at least the bosses are in place should you wish to go with cantis or V brakes. But that would mean new wheels and more expense. And that front loader looks all wrong, though might have been put on in a hurry for the photo shoot. I count 36 spokes on each wheel. I think the racks are angled purposefully, so the bottom of the panniers have more room to clear your feet, but I could be wrong. I can see the racks being angled like that on purpose for foot clearance, but wouldn’t that put extra stress on the pannier attachment at such an angle? I would expect that extra stress, especially on bumpy terrain, to really effect the life of my panniers. I could see that. I have a pair of Back Rollers, and I don’t think it would affect them negatively because of their robust mounting system (I could always switch sides after a while too). Some panniers may be more prone to falling off or breaking because of the angle. I’m definitely intrigued by this bike. Most of my riding is commuting, but I do regular, loaded day trips to visit friends. It seems like an ideal all-weather commuter with the ability to carry quite a bit, which makes it perfect for me. I doubt I could buy it without riding one first though, and it’s not a bike that a shop would typically stock. It seems to me that if you have to angle a front loader like that (a bodge job) to give adequate foot clearance than there’s something fundamentally wrong with the design of the bike. I bought an 09 Sutra just last week. Got a deal at AUD$1540. I upspecced the cranks straight off to XT 48/36/26. My girlfriend and I got the same bikes size 54cm. Toe overlap: None noted. Or not an issue. And just so you know I’ve been riding/racing for 20 years. Build quality suspect: some braze ons were mis-aligned on P2 fork. Rear rack: Very nice stiff rack by Racktime (made by Tubus). Front rack: Rubbish. An afterthought and does not even fit the braze ons. Ordering a Tubus Tara. Otherwise, comfortable buzz free ride – this is my first steel bike in about 12 years. Very stable and confidence inspiring. Brakes very good – they bedded in half way down the 17km descent and worked very well. We have Ortlieb Bike Packer Plus rears and they fit fine with no heel clearance issues. Seriously very happy. Will report back after first loaded tour Nov 1st-4th.. if you like. AUD 1540 is a good price – where did you buy that? So far only 56cm and up are available in the bike shops I asked…..
Has anyone had much experience with the Kona on treks over 1,000km? I’m looking forward to your report on the ride you’re doing from Nov 1st-4th. How did the tubus tara work out? Does it mount high, or low? I have Ortlieb Front Rollers on the front and the manual says they are supposed to mount high. Wondering if the tubus has options. Well, I got a 2008 Kona Sutra last week. I’m disappointed that it isn’t the 2009 frame with new rear rack and fender mounts and the Racktime rack. I bought it basically new for $700 USD though, so I can’t complain. I doubt I’ll use the rear rack mount because I’ve heard of so many problems with it. If I need a rear rack, I’ll probably get an Old Man Mountain disc-compatible rack, but I think I’m going to use a Bob Yak for any large loads. The studded tires are going on this week, and it should serve me well for commuting this winter. The whole bike seems very solid so far. Bought the Sutra last week, haven’t been able to seriously test it, but will in the coming month. Was wondering if anyone had mounted mudguards on it without removing the disc brakes? Cheers for the thoughts guys. I really like the look of this one and need it for commuting (light load), day rides and then one big trek this summer. On the basis of the comments I am of to give one a go and the green is superb!!!!!!!!!!!!!!! Me again. I’ve taken my Kona on a serious tour now (>500km), including some bumpy dirt roads and serious climbing. The report in general is very good. Racks – I’ve had no trouble with either rack, though my front rack is mounted slightly differently to the one in the photo above. I’m carrying spare 35mm bolts just in case though, and have been checking the bolts regularly, though they have never loosened. Foot clearance – No trouble at rear or with toe overlap. I really like this bike, and would definitely recommend it. It is mega tough and fun to ride. My 100kg mate has a 2008 model, and has never had any troubles, including when it was vandalised! Personally, I prefer the better braking, but if you want to mount mudguards and have better rack compatibility, the Surly Long Haul Trucker might be better for you. i would like t buy a nKona sutra but i don’t know if the series front rack can fit an ortlieb pannier(ql1 or ql2 ). I had to file down the rack a tiny bit to fit my front roller classics (ql1) and they now fit snug. As an aside, the braze-on for my rear rack snapped off my bike. Still waiting on the bike shop to see if the warranty covers it. I had a weld crack on my rear rack during a 4000m tour, and Kona was pretty good about replacing it. If it’s under a year old, it should be fine. I’d like to do another tour on it, but I’d choose a trailer over new racks. Between attaching fenders, racks, and full panniers, the disc brakes start to suffer. I brought this 2008 model and have so far completed two heavily loaded tours 3000km and 1000km respectively. the bike is legendary. While my touring companion had problem after problem, the kona shined. The chain is now beginning to wear out, but after 5000+km that’s not bad. I recommend this bike for touring and commuting, its fantastic value and has never let me down. I have been riding a 2009 model since June now. Not having any biking experience whatsoever, I chose this bike because of its sturdiness (weighing in at 220lbs and planning some loaded tours), the drop bars (I get restless in one position – nice name, Sutra), the comfort and the option to take it one some faster, lighter tours. For me, not wanting 4 bikes to look after in bike-theft-paradise Amsterdam, it seemed to be a good option as a multi-purpose bike. I have been browsing and talking quite a lot, deciding between an LHT/Sutra/Gran Turismo, a tweaked cyclocross-bike or a randonneur, and despite the cons I have read about regarding the Sutra, the looks and the fact that the local dealer stocked it made me go for the Sutra. Having done one big heavily loaded tour and a lot of errands including (grand-)parents (every corner of the Netherlands is reachable by bike), grocery and day trips, I must say that I have seen only one point of weakness: lubrication. The builder apparently decided that it was better to apply too much lube than too little. The result was that I had to bike 20miles in rural Poland with the seat all the way down because the clamp broke during my attempts to fix the seat at a certain height. A side-effect was that I had to wait for 45 minutes before the local bike mechanic came up with a solution to fix the seat at a certain height. On the other hand: foot clearance (US size 11.5) and wheels (total weight surpassing 300lbs, excluding the bike itself) were no issue whatsoever. The bike handled very well, even on the notorious Polish roads, and it was able to survive every (pot-)hole or kamikaze-driver encountered with ease. All in all, I would recommend this bike to anyone that wants a versatile bike that can take some rough. I do not have the experience to compare it with other bikes, but the speed (it is fast), the looks (people notice it) and the sheer sturdiness and comfort make me look forward to the next time I will take it out. And I am pretty lazy. Ignorance being bliss or not, I am convinced this was the right choice for me and that’s what counts. I purchased a 2009 Sutra last May and put about 3500km on it last year, mostly commuting and day trips. One week long self supported trip. It rides well loaded and I’ve had no problem with toe overlap even with mudguards installed (had to customize the mounting struts a bit due to the disc brakes but easily done). I ditched the front rack and replaced it with a Tubus Tara low rider rack. I’m quite satisfied with the bike so far. Thinking of building up a new front wheel this year with Shimano DH3N72 dynamo hub/Edelux LED headlith and Bush DToplight rear light so I don’t have to keep charging batteries all the time.